Open any magazine and you may see many slim faces with perfect cheekbones and noses. To mimic such photos, here are a few tips to make your face look slimmer, instantly. 1. Primer. Using a brightening and tightening primer before makeup can instantly tighten skin and help decrease puffiness, particularly underneath your eyes. 2. Sculpt cheekbones. Glide a creamy peach blush stick in a curved “U” underneath your cheekbone, and then blend upward. 3. Contour. One of the quickest ways to make your face appear slimmer is to contour. A pressed matte powder that’s one shade darker than your skin can be a round-faced gal’s best friend. Using a flat brush, apply a contouring blush or powder in a soft line angled down your cheeks. Start slowly and keep blending to avoid lines. You can also use the same trick on each side of your nose to help it appear slimmer as well. 4. Fuller brows. Thin brows make things look larger. Adding fullness to your brows will flatter your features. 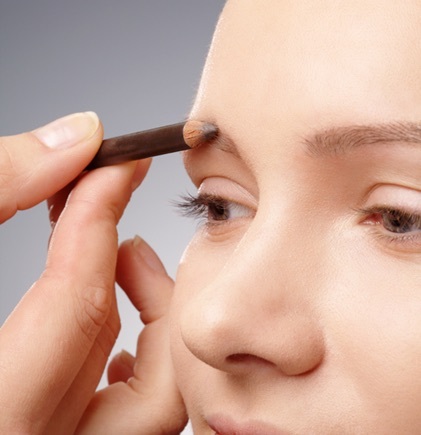 Angled brows add contour and make your face appear thinner. 5. Bronze. Bronzer has an instant slimming effect on the face. Use a sheer bronzer to highlight the skin after contouring for a healthy glow that accentuates light in all the right places. Apply with a powder brush, along the forehead, cheek, and jawline. Don’t forget to blend everything into your neck. 6. Brighten. Applying a sheer highlighting powder under the eyes and down the nose for a brightening effect will cause the contoured and bronzed part of your face to stand out more. This creates a shape that is slimming and flattering. Use a light hand, blend well, and with practice this will take mere minutes.